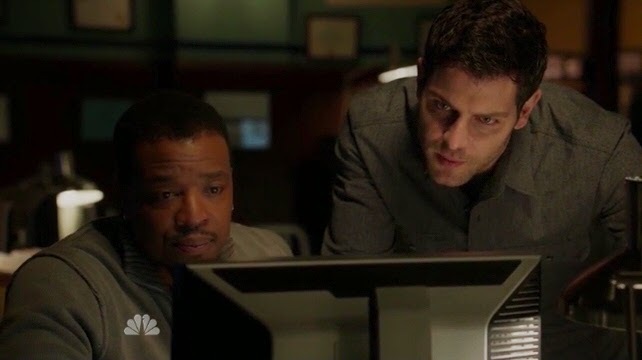 A cyclist's homicide introduces Nick and Hank to a Wesen with a tragic fatal touch in this week's Grimm Heartbreaker. Captain Renard and Adalind learn the Royals have stepped up their efforts to find their child, and another member of the Royal family is introduced. Meanwhile, Juliette ponders the idea of embracing what she's become as opposed to fighting it. Juliette has totally my comprehension. She wants her life back, since she was normal before meeting all those Wesens who made her world upside down. But even Nick's love seems to be enough for her, because she's determinated to come back as a human being without all those mosters she's been surrounded over these years. But dear Juliette, friendly reminder: you were the one who accepted to give Nick his powers back early this season. No one forced you. Nick tells the truth Hank about Juliette and how he can't handle with the whole Hexenbeist thing. I think for the first time in his Grimm's life he can't deal with a Wesen. Poor guy. Meanwhile, Wu calls Nick and Hank because there's been a murder in to the woods. A cyclist is found poisoned and dead but by the look on his face, they think there must be a Wesen behind. Wu is particularly enjoying this case, especially if he can pronouce the Wesen's name. According to the cyclists, who used to ride with the victim, the first suspect is on a girl named Bella Turner, whose he was in love with. They tell Nick and Hank that she never hangs out with anyone. Bella is good in hiding her woge side, in fact the two detectives can't accuse her properly. She must hide her true side because her touch is mortal to anyone who tries to approach her. In the end, Bella's family reveals to be the one troubled. Luckly, Monroe and Rosalee help Nick and Hank to prepare a kinda of spell that can stop Bella's poisoned touch. At least, the frog princess can have a normal life, like she's always wanted. Adalind is kept prisoned, desperately waiting for Viktor to accomplish her crazy plan we talked about last week. A new Royal comes to visit her (how many Royals exist? ), Prince Kenneth, and he finds out she's full of surprises - her belly is already showing bigger than before. When he asks about the father, Adalind claims it's Viktor's - but he's sterile, so the truth will soon come out. Kenneth shows no mercy when he beats up Sam for being a double agent, and later meets with Sean Renard, who has his own issues with the prince and the Royal family. After the two fight - does a Royal even fight? He seems pretty weird to be a Royal tipe to be honest - Kenneth makes a point: Renard must chose which side he is, with the family or against them. Juliette comes back home just to bring her stuff, but is Nick going to let her move out? Or is she the one who doesn't want to be part of his world (and his heart) anymore? She's embracing the dark side, just like a female Skywalker. Honorable mention: Trubel sent Nick an email asking if everything's ok. We miss you, Trubel. Here's the funny thing: while Bella can't accept she's a Wesen because she can't have a normal life, Juliette starts to enjoy her Hexenbeist look. I really liked the positive end of the episode, showing us Bella - with some side effects on her face - and a tatoo guy on a first date. I didn't like the soap opera tone this show is getting lately. Do you agree? Meanwhile, next week: "She's a freaking Hexenbeist!" Diana (diana mack) is a tv shows addicted. She's from Italy, she dreams to be a real journalist someday - meanwhile she speaks english even in her dreams. But tv series are not the only passions she has: she's a football supporter, cinema lover and a traveller. She studied languages (english, french, spanish, arabic and a bit of portuguese) and journalism in Rome.